Our mindset at Paste is currently turned squarely in the direction of Halloween, but leave it to JD McPherson to emerge from left field with tidings of comfort and joy instead. We’ve long been fans of the retro rock performer, who dazzled us with 2015’s Let the Good Times Roll and 2017’s Undivided Heart & Soul, but a Christmas album? We’ll let McPherson speak in his own defense on this one. Judging from the first few songs released on Socks, it does sound like we’re in good hands. 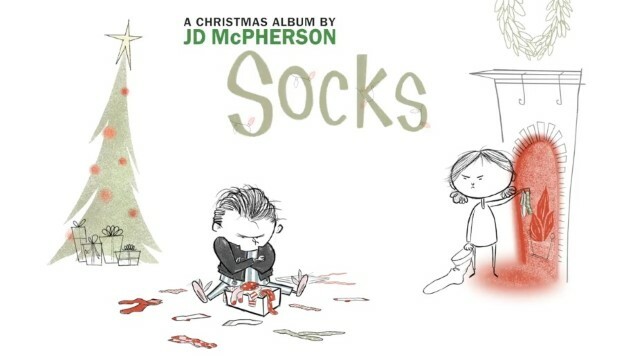 First is the title track, an ode to the disappointment felt by every child who has ever received SOCKS as a Christmas gift. Our own personal favorite, though, is “Hey, Skinny Santa!”, a rollicking, ‘50s-style jam dedicated to gluttony and regional cuisine. We can only imagine that this song is a compendium of favorite foods of McPherson’s band members in the cities where they perform regularly, whether it’s “Italian beef with giardinar-y hot and sweet” in Chicago, or “fried oyster po’boy and a nice lagniappe” in New Orleans. It’s hard not to smile at the deft, foodie wordplay in this one. Socks is scheduled to arrive Nov. 2 on New West Records, and is already available for pre-order. In support of the album, the band will embark on “SOCKS: A Rock ‘n Roll Christmas Tour,” with shows in Chicago, New York, Philadelphia, DC, Atlanta, Nashville and more. See full tour date below.